Why did you give your life to Jesus: My relationship with Jesus means the most to me. I love Him with all my heart, and praise God for what He's done in my life. I can't imagine my life without Jesus. Well, I can...and it would be horrible! He has given me love, forgiveness, compassion, and hope. It's amazing that Jesus died for all the things I've done wrong in my life! There is no other option for me but to serve the one true God, Jesus Christ. God has taught me over the past 6 months to never forget His promises. Joining Skillet is something I've always wanted to do. It's been the desire of my heart to serve God through music, and He's given me that chance. He's taught me to look to Him for everything and to find strength through Jesus. Who's had the biggest influence on your life: Early on in my Christian walk my best friend Shelly Synder was a huge influence in my life and she continues to be. My elders also have helped shape who I am today. What is your favorite thing about doing what you do: Knowing that I'm exactly where God wants me to be - doing something I enjoy for His glorification. 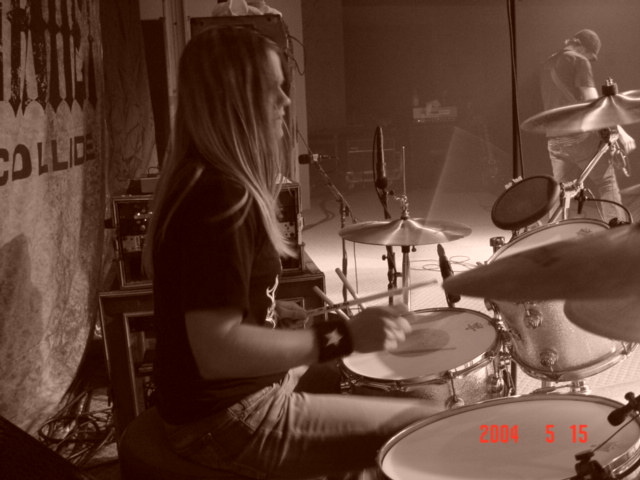 Playing drums is so fun - I love it! Will: Well okay. What is it like being a chick drummer? W: Are there any other in the Christian industry? W: I don't know of any... I know that in the secular industry there's a couple. L: Yeah. Well John said that from stage once, at a festival and this woman came up to me backstage and she's like, 'Well you're not the only....... girl drummer in Christian music,' she's like, 'I played with so-and-so.' She was a bit older than me. I don't even know what band it was. W: He, he did say that at AtlantaFest. That might not have been when she talked to you. L: It was somewhere up near Washington. W: Oh. Oh well then.... he must've said it... more than once. L: So I know there's a few out there that are actually in signed bands. *pause* I think he's now changed it to saying the only rock.... er.. the only chick drummer in rock music. Christian rock music. W: What'd your parents think of it? Like, were in like a band in high school and stuff? L: Yeah. Yeah I played in orchestra and symphonic band, jazz band. My parents, my mom's really supportive. My step-dad is supportive. They're really excited for me... for me to audition. Cause I didn't, I didn't think I was gonna be good enough. Which I wasn't. But.. John... John gave me the chance to practice and become.... ya know. I've gotten a lot better but at the time I started I wasn't good enough. W: Now you were with Korey before in another band, right? L: Right. It was called Alkeme. W: So.. what kind of stuff was that? W: So are y'all... is that band totally dissolved or what? Did y'all have an album out? L: Yeah we did like an indie album. W: Well okay. Since the tour's coming to a close, what has it been like the past three months? Living with these guys on the road? W: That's what everybody's been telling me. L: Well it's been a really good tour. This is like... my forth Skillet tour I think. It's been the best. W: You did Festival Con Dios... you were on the worship tour before that right? L: Yeah.... yeah this is the best I think. W: What are you doing after this? After the Alien Youth tour? L: Going home. Yeah going home. Spend a lot of time with family. Enjoy the holidays. W: And y'all start back in December.. sometime in December, I think. W: Okay and final once, this is one we are asking everybody. Since we are Panheads.org.. I don't know.. have you read the definition of a Panhead that Ken gave several years ago? L: I think I've read it but I couldn't say it. W: How would you define a Panhead? L: Let's see... someone who....... is..... *chuckles* freaked out for Skillet. Who would drive like, ten hours to come see us and who has kinda gone through all the changes with the band and still loves the first album as much as the current album. Just.. someone who loves what we do, loves God, and loves our ministry and stuff. Yeah. But ya gotta be freaky.